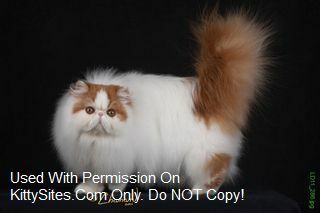 Ciders Haven is a Bi-Color Persian and Exotic shorthair Cattery with beautiful bicolor Persians and exotics as my breeders. I have a small Cattery. My Persians and exotics are raised in my home, and all of my babies are raised with a lot of love and attention. I have a huge passion for these wonderful creatures and love them dearly. They all are given a lot of love and attention right from birth, and are raised in a clean healthy environment. My goal is to produce Persian and exotic kittens kittens with a very sweet personality, and with round or tear drop eyes with a sweet open expression that I love so much. Perizms Persians – I breed solid, particolor and bicolor persians. We now have kittens available for adoption. Purrfectkeeperz – Traditional Doll face CFA Persian, Himalayan & Ragamuffin kittens in unusual color combinations.